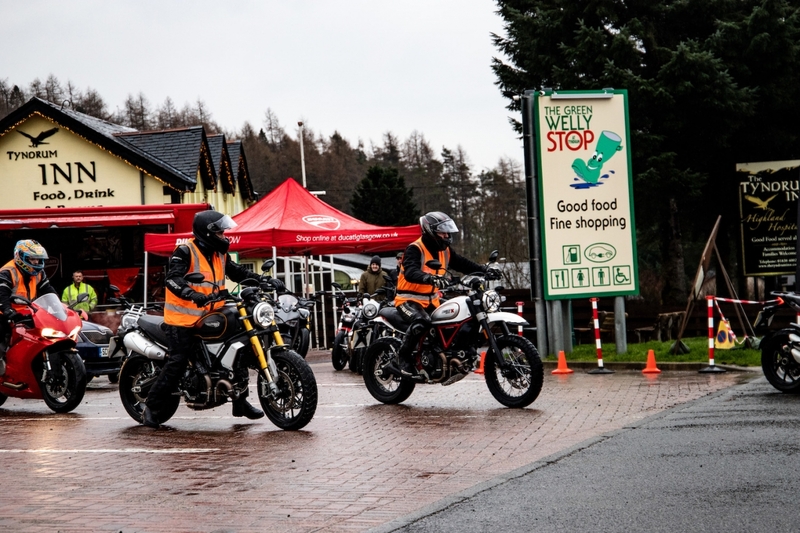 It was a soggy start, with snow sighted in the morning of Saturday 6th April 2019, so the team from Ducati Glasgow, Ducati UK and the California Superbike School turned on the heated grips and started to warm up the engines while unloading the entire 2019 model range demonstrator fleet. 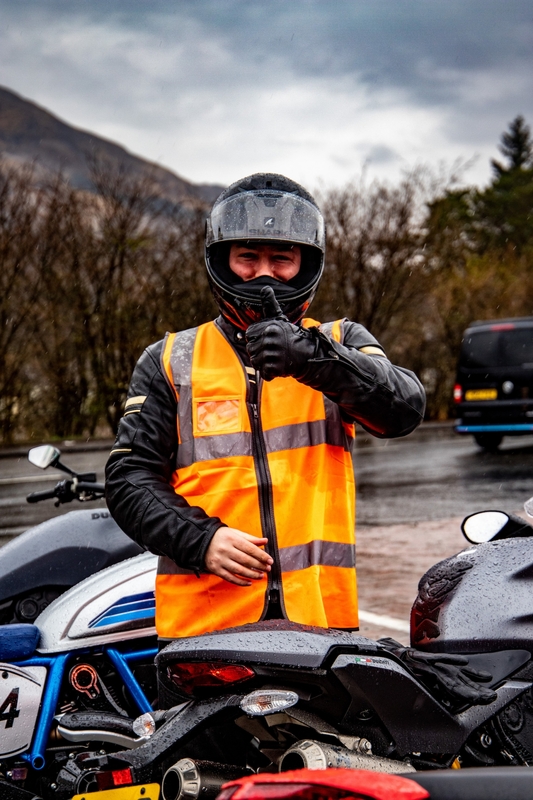 For those who met the requirements, the group rides headed out from The Green Welly Stop towards Dalmally on the A85, for 15 minutes, turned and returned, closing a 30-minute ride in total. Pre-booked rides left every 45 minutes from 10am to 4pm across the full weekend. 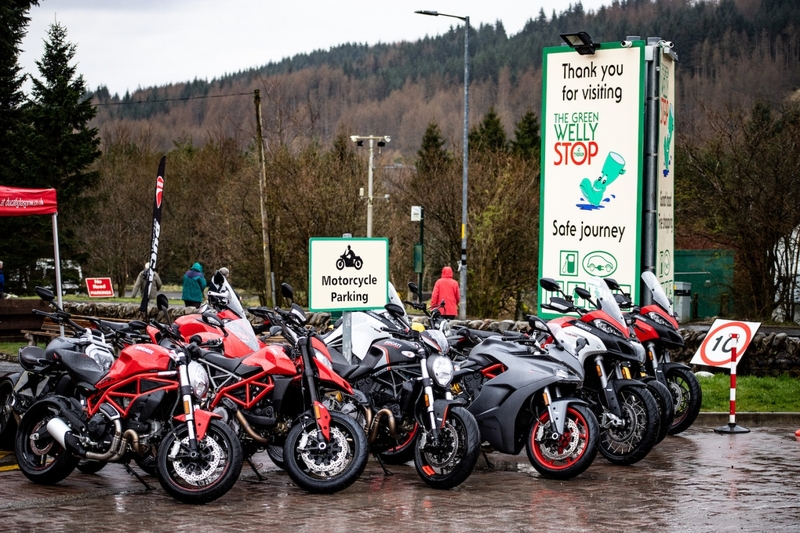 With a total of 18 bikes available, fully booked slots, better weather as the weekend moved on - this gave plenty of opportunity for riders to experience the 2019 Ducati model range. 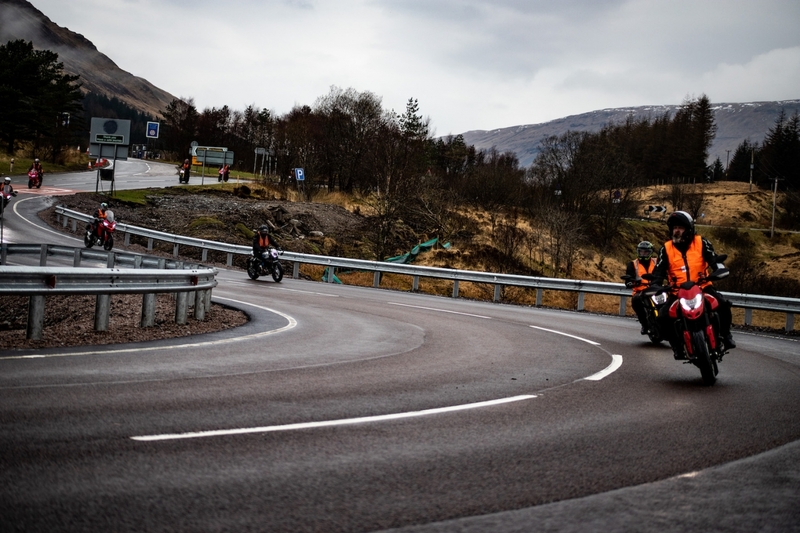 The Ducati Scrambler range were some of the most distinctive bikes on display. The Desert Sled and Full Throttle appealed to those looking for a retro fit, while the Cafe Racer with its matt silver paintwork and two-tone blue detail proved an eye-catching machine which left onlookers studying the alternative aesthetics you wouldn’t expect for a Ducati machine. Every rider who experienced the Diavel 1260 S fell in love with this dark, inconspicuous performance cruiser. Those who were lucky enough to throw a leg over the dark side of Ducati, were all astounded with the performance, handling, torque, maneuverability of this bike. With a 41-degree lean angle, cornering ABS, 159 bhp and 129 Nm of torque at 7,500rpm, as well as an impressive 240 mm rear wheel - it’s no question as to why. Plenty of adventure riders who arrived on their GS’s and Tigers were keen for a comparison ride on the Multistrada range. Even previous model Multistrada owners couldn’t believe the technology and improvements within the 1260 and 1260 S models. The Ducati Panigale V4 and V4 S were completely reserved for weeks prior to the event, although the good news is these revolutionary machines are available to test ride from the award-winning Hillington Park showroom, where the Panigale V4 R with it’s carbon wings, and the Panigale V4 S Corse are out on display for you to admire and order. 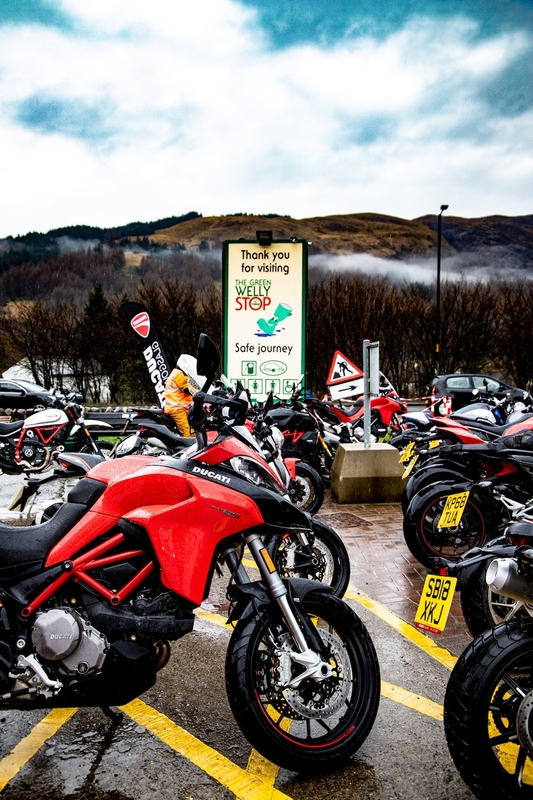 Bikers from all over the UK attended the Ducati Glasgow Roadshow at The Green Welly Stop, including a few who’d travelled by bike from Newcastle and even one Ducati fan who’d travelled over on the Friday evening from Stornoway, Outer Hebrides! 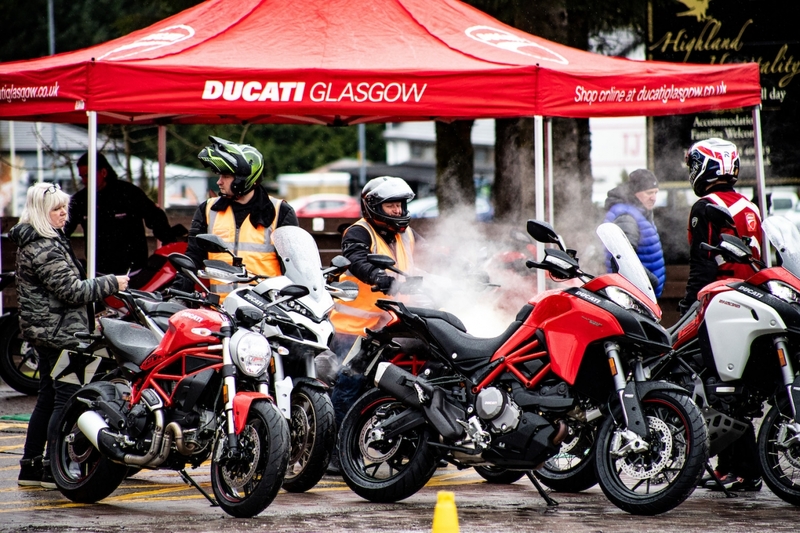 So, if you fancy trying out a new Ducati, seeing some immaculate and limited-edition bikes on display without even having to visit a dealership, all courtesy of Ducati Glasgow - the Ducati Roadshow is definitely a date for your diary next year.